Rendezvous has plenty of engine gauges and info, especially since I added the Actisense EMU-1 engine monitor. But one area that was still lacking was how much diesel fuel I had. I could open up a storage area and read a sight gauge, but I wanted to have a lot more real-time information while underway. Understanding burn rates and general fuel usage depending on speed, weather, current, etc. is very hard to do unless you take readings at the sight gauge frequently. I have anecdotal information about various RPMs and gallons burned per hour, but I like having as much info as possible, especially with longer trips to more remote areas planned this year. Having more info will help plan fuel stops and ultimately be a safer situation. 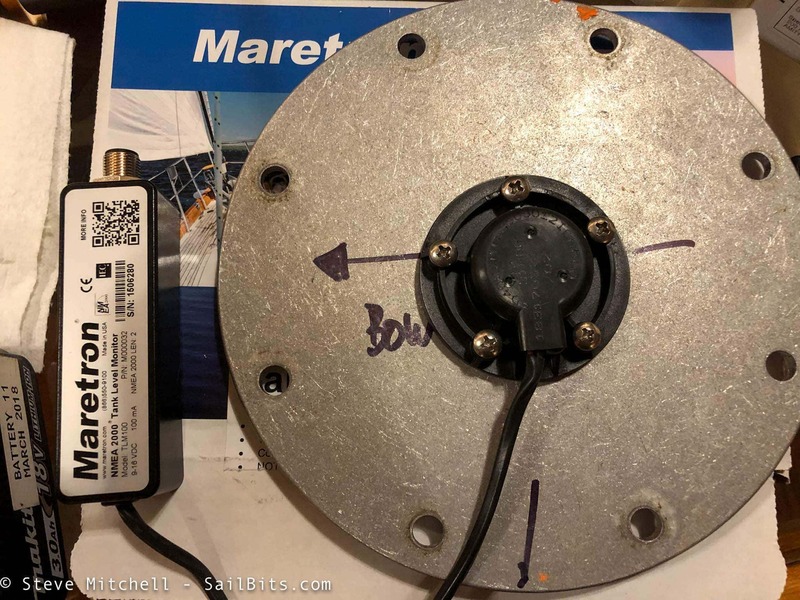 Back in 2014, I wrote about Better Tank Monitoring and used a Maretron TLM on my boat Jammy to fix a bad waste tank setup, and add monitoring to my water tank. I had several on my previous boat Grace - one for the water tank, and one for the waste tank. 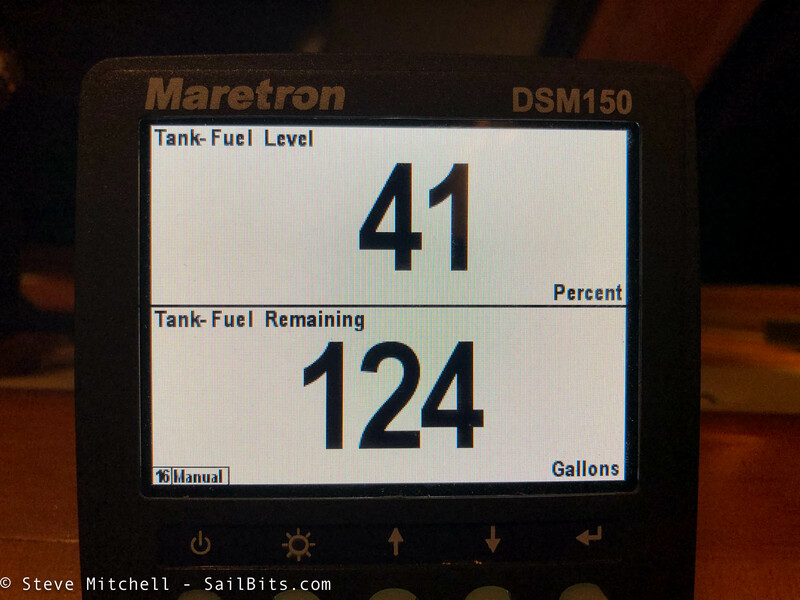 Even today, the Maretron TLM is still my go-to product for monitoring my tanks, and Rendezvous was going to get one for the fuel tank. My diesel tank is under the master berth, and after a bit of sleuthing, removing some screwed down panels, I found two big inspection ports. Each one was bolted down and had a nice rubber seal around it. The bolts were relatively easy to get off, and didn't show signs of issues. The cover itself was aluminum as well, and looked pretty easy to drill a hole in. 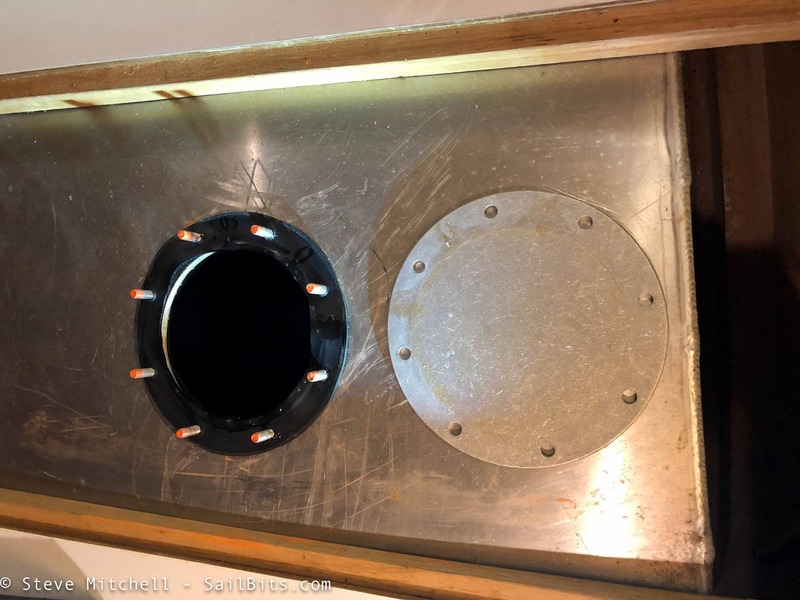 While I had it open, I looked around inside the tank - it looked extremely clean, had great baffles in good places to slow down any waves/churn while underway. Just don't drop anything (like your phone!) down here! I labeled the port cover clearly based on where it had sat before, and also based on the way I wanted the sensor to sit so the cable exited a particular way. I cut the hole for the sensor portion itself first using a hole saw, judicious amounts of cutting oil, and patience. For anyone who has ever used a hole saw, you know that it can really hurt your knuckles and hands if you go too fast. And that is an understatement. I clamped the cover down tight while ensuring I was at a slow speed with lots of oil, and a few minutes later I had the correct sized hole. Then one by one, I drilled out holes for the bolt pattern for the sensor. It's important to align the rubber gasket correctly, as it only goes one way - Maretron use a wire tie and tag to warn you of this. 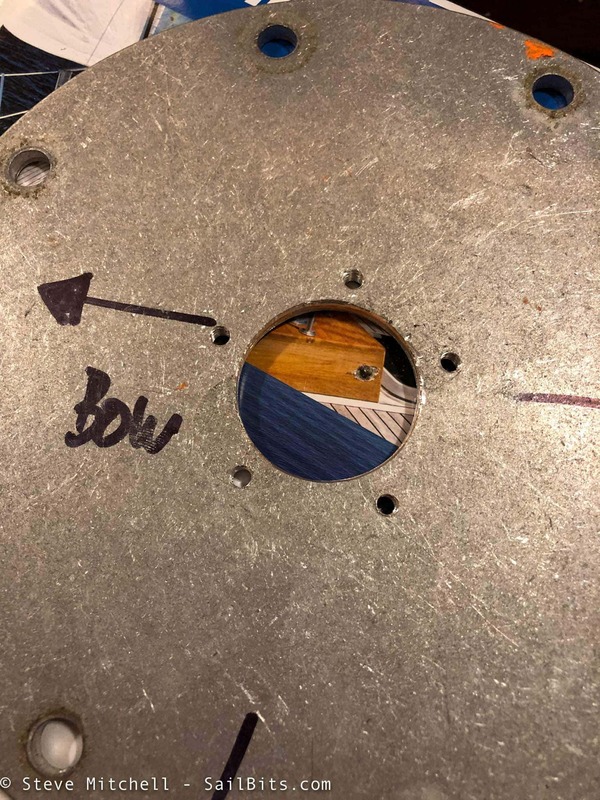 A quick run through with the correct sized tap, and the holes are ready to receive bolts. 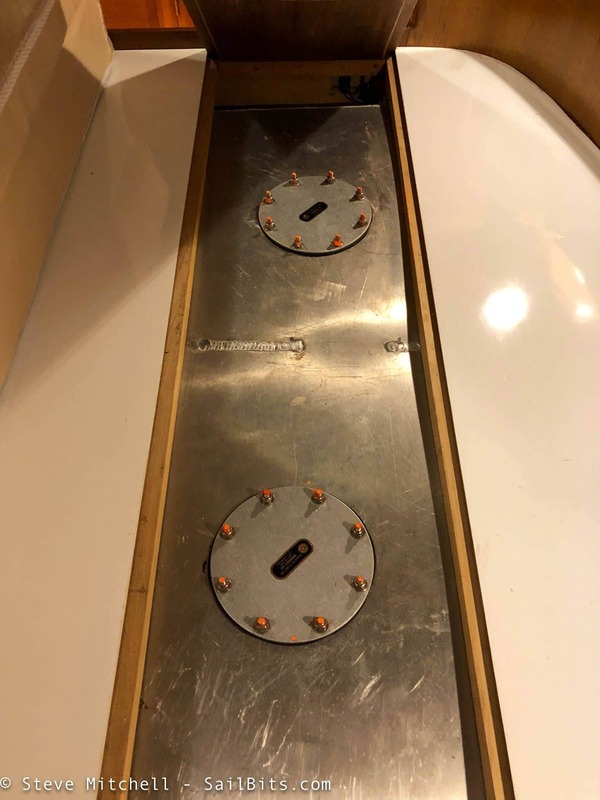 Once the hole was cut, and the bolts were in and secure, I test fit it all, and it looked perfect. 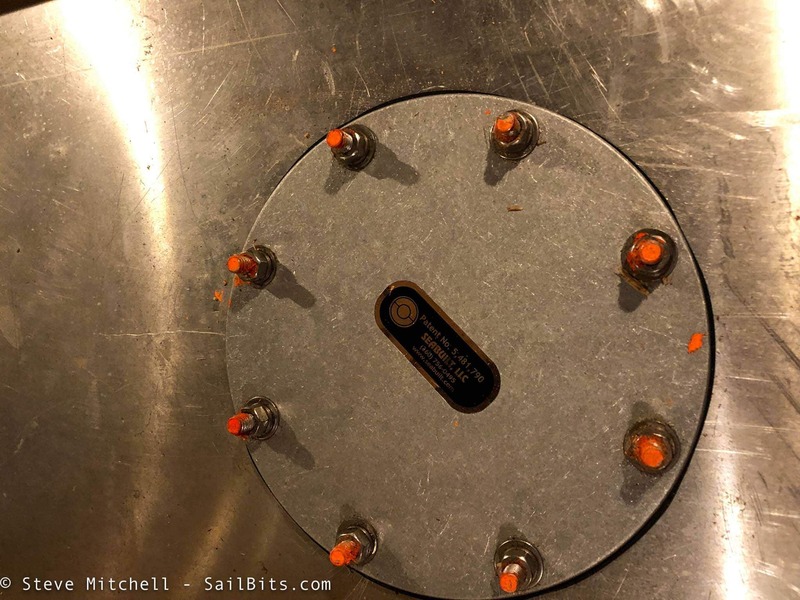 The final step was to spread a thin layer of petroleum jelly on the bottom face of the sensor to keep it clean so it worked longer without any interruptions. 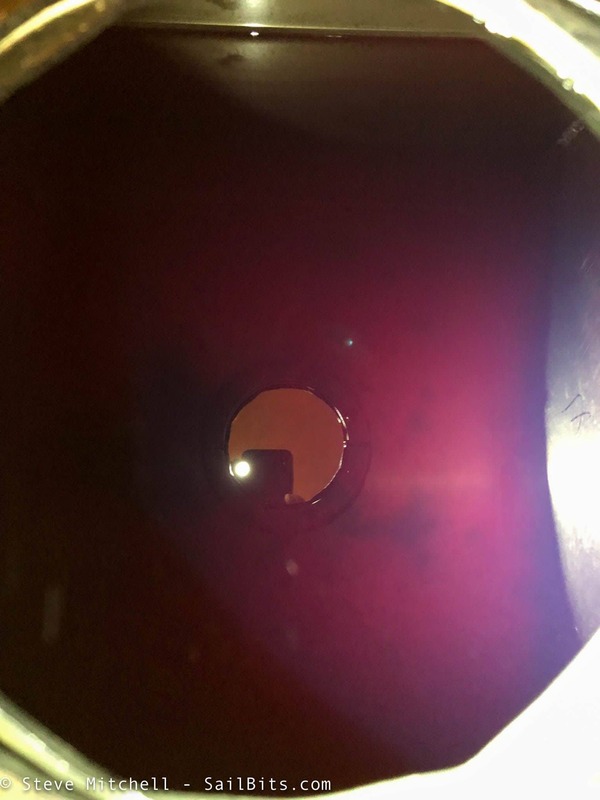 Although I doubt that diesel would cause any sort of build up on it, I still didn't want to have to open this port again unless I really needed to. The next step involved configuring the tank sensor on the NMEA 2000 network with my Maretron USB 100 adapter and N2KView software. I could have also used my DSM display, but I find N2KView much easier to use. 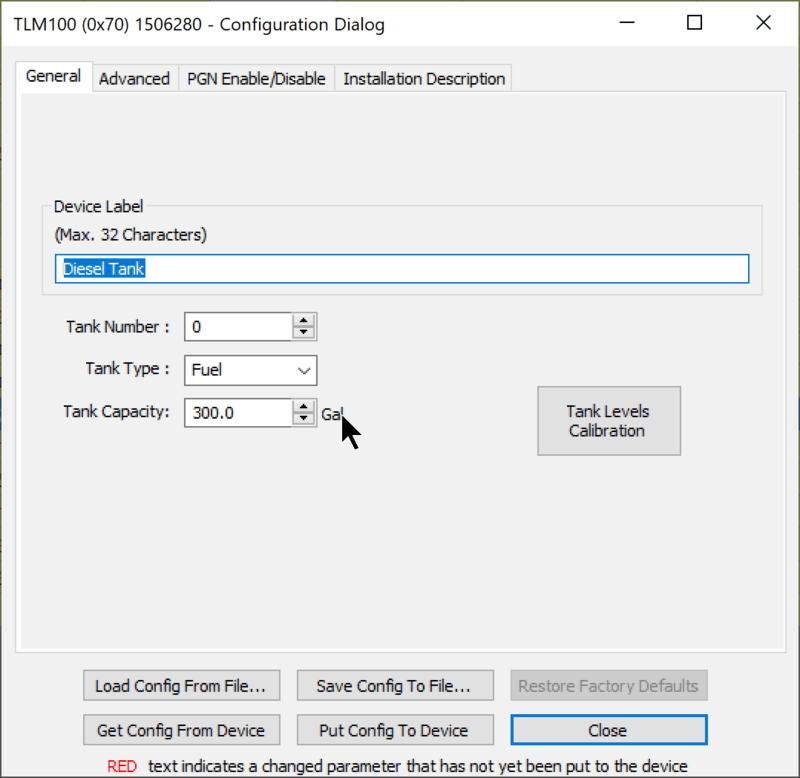 I set the label, tank number, tank type and overall tank capacity. 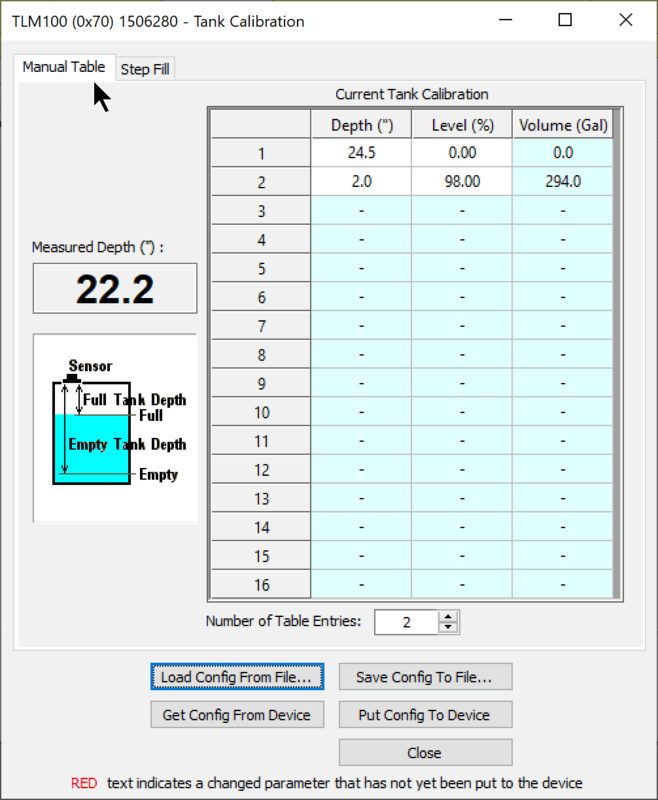 The next step is to calibrate the tank by setting depths and levels. My tank was 24.5" deep from the face of the sensor to the bottom of the tank. The sensor can't read anything closer than 2" to it accurately, so I estimated that would be about 98% full, but I think that might be wrong after seeing that about 2.5" of diesel (which is what I have in there right now - quite low!) is about 10%, I may need to change that value to 95%. You can add as many values as you need to improve accuracy, but I have found two do just fine on nice square tanks. For funky shaped tanks, you will definitely need more values to make the values in the middle accurate. 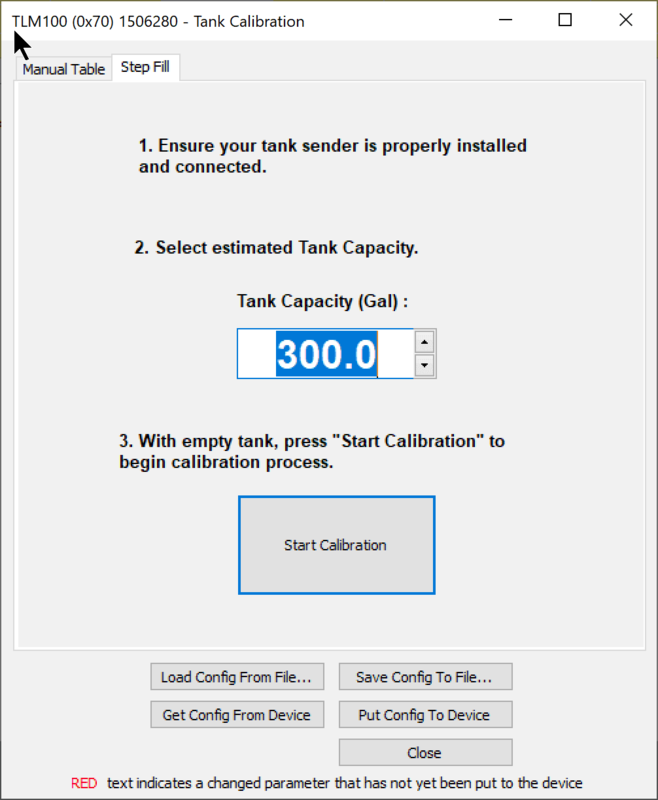 Another option is step filling a tank and calibrating the sensor automatically. For me, this would not work as it requires the tank be empty, and since I only have one diesel tank, that would require some sort of dangerous choice like driving around until I was on fumes, or smoking out the fuel dock while I idle the rest of the fuel away. 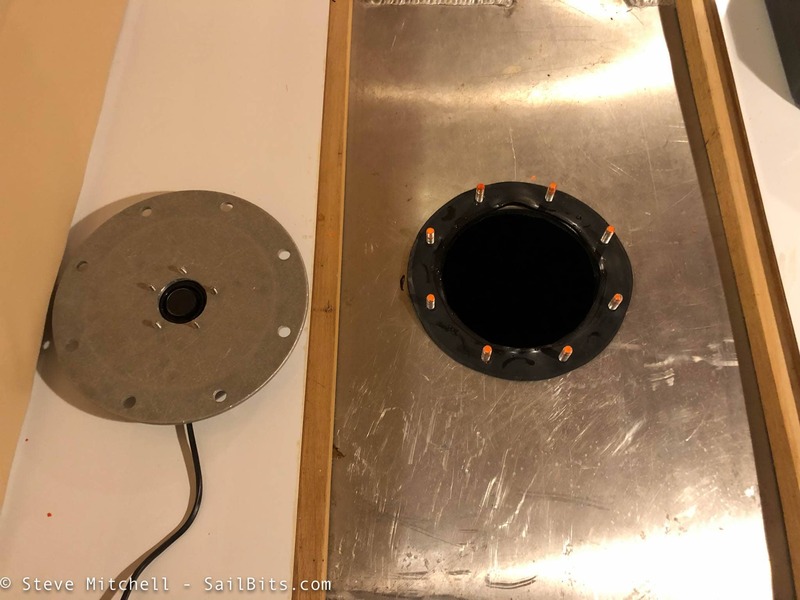 For water and waste tanks, this works much better, and I have used it on several strange shaped tanks with a lot of success. Once the config was done, configuring a quick screen on the Maretron DSM 150 display got me exactly what I had been looking for - a percent fuel left, calculated from the height of the liquid in the tank by the ultrasonic sensor, and an additional calculated value of how many gallons were left based on the total gallons I entered during configuration. This second calculation, the 124 gallons left in the picture above, is something to definitely be careful of. My tank is exactly square, or pretty close, and I suspect this number will be pretty accurate. However, if you have a strange shaped tank, or even slight changes to the bottom surface, this estimate could be quite a bit off unless you enter multiple values in the table above. From what I can tell, it is simply taking the total gallons in my tank (300) and doing a percentage calculation based on the first number. Next up, getting one of these in my water tank, which I have run dry already a number of times. Unfortunately, there aren't any inspection ports, so I am considering how I want to approach that install! For now, though, I am super happy at having an accurate level of fuel for Rendezvous, which helps me sleep better and allays my tendency to check every 5 minutes while underway!